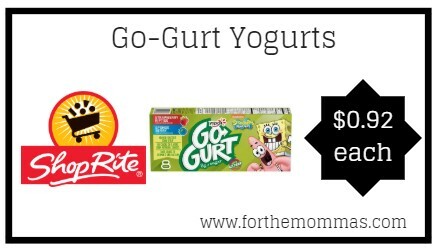 ShopRite: Go-Gurt Yogurt JUST $0.92 Each thru 1/26! Thru 1/26, ShopRite will have Go-Gurt Yogurts priced at $2.50 each. In addition to this, we have a Go-Gurt Yogurts coupon insert to use on this deal. Plus you can earn $5.00 catalina to make your final price $0.92.